How to forge good business relations in Japan ? 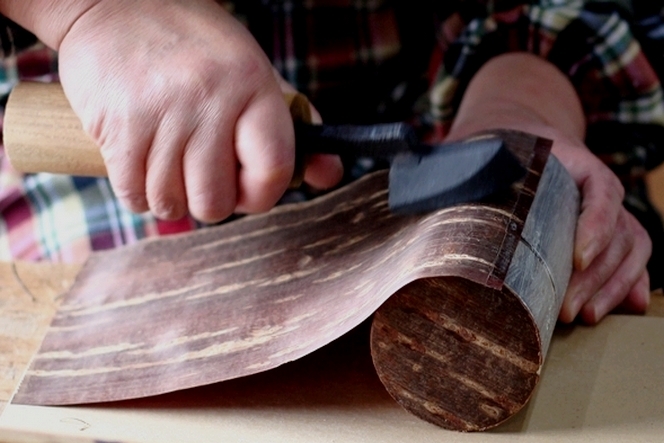 There is a Japanese tradition that is completely unrelated to tea, but I like it so much I want to tell you about it. It is about the famous onsen, the hot springs. In a volcanic country like Japan, with all that matter fermenting together underground, it is no surprise that boiling water erupts from the ground everywhere. There are many hot springs in the land of the rising sun. The water temperature is so high that even in the middle of winter, it can make you hot even when your shoulders are exposed to the cold air. The onsen are an extremely popular destination among the Japanese: they bathe in them to relax, rest and even cure themselves. They spend weekends, even entire vacations, in them. You go to the onsen with your family and your friends. When you go with a client, or a business contact, it is known as “hadaka no tsukiai”, or “naked communion”. The Japanese believe that bathing together, naked, is a way of showing yourself as you really are, with nothing to hide. This is important, they say, if you want to forge transparent business relations. Here, near lake Tazawa, the deepest in the country, I am taking part in “hadaka no tsukiai” with Koichi Fujiki, a producer of tea canisters. We want to work together, for a long time, to be able to trust each other in business, without hiding anything. And this is how you do it! 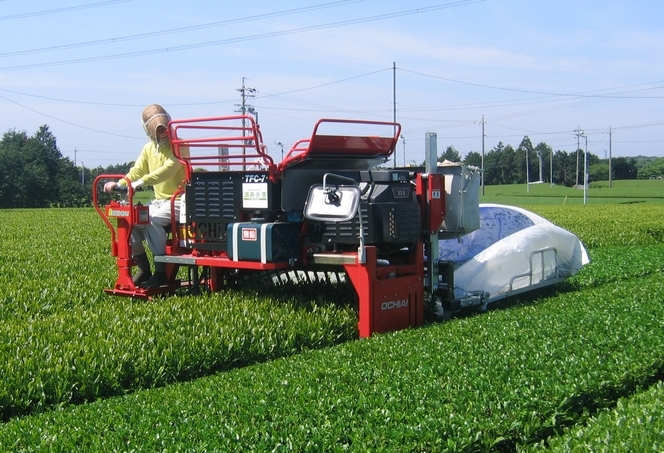 These days I was nearby Shizuoka, the main tea producing region of Japan. I took this picture in Tawaramine, a highly considered place for growing tea. Beyond the harmonious curve made by the row of tea trees, one can see the city of Shizuoka spreading out on the border of the Pacific. The farmers of Tawaramine, just like the ones of the other surrounding mountains (Asahina, Hirayama…), don’t have much to complain this year. The harvesting of tea is of course very much delayed this year due to the cold weather of April and the shoots are only beginning to show up. 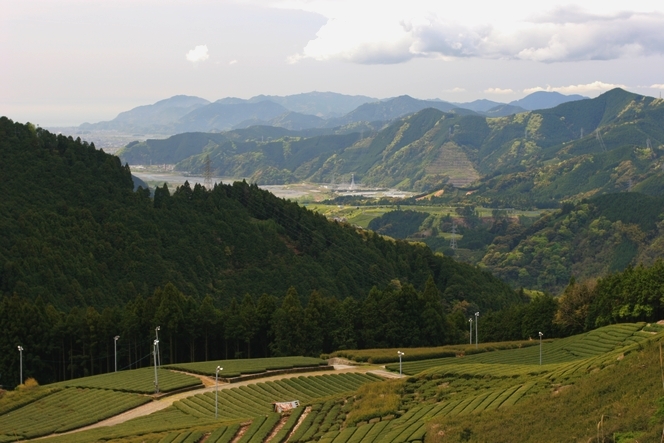 However they do not have to experience the disaster of their colleagues located on the Makinohara plateau: because of a lower altitude and an early spring followed by a rough cold snap, the tea trees have simply frozen, and as a result the production of tea is partly compromised for them. So from Darjeeling to Shizuoka, from Yunnan to Anhui and from Zhejiang to Fujian, the harvests are really delayed this year. I’m happy to introduce to you my friend Hisanori Masuda. 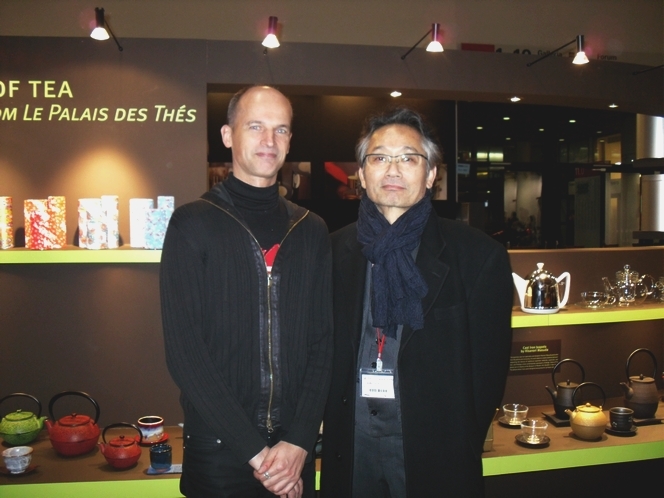 Hisanori is a famous Japanese designer who creates great models of cast iron teapots. 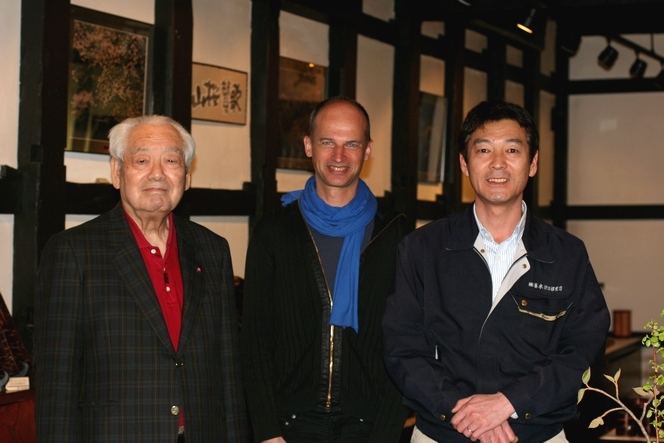 He has exhibited worldwide (in New York’s MoMa for instance) and teaches at university in Japan. We have known each other for fifteen years thanks to Kayoko Nishikawa with whom I travelled a few times in the north of the archipelago, notably in the district of Iwate. It’s in fact the region where cast iron teapots are made. They are still casted one by one today. Hisanori has also made very nice models of tea kettles, with a simple, traditional and meticulous design. The Hikime, Chokaku and Natsume teapots illustrate his work perfectly. We got together last week at the Ambiente fair in Frankfurt. Hisanori came to visit the Palais des Thés’ stand and I thus presented him to our team who was looking forward to meet him. This photo was taken for the occasion. 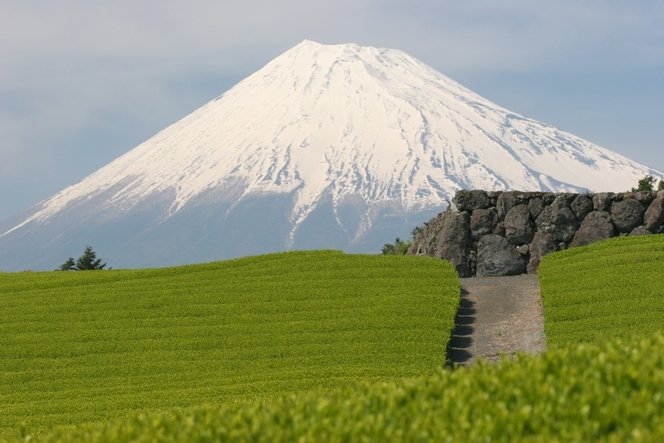 There are many tea plantations around this Japanese peak, but it’s not easy to find a spot where you can only see the tea garden with Mount Fuji in the background. You have to drive around the narrow back roads, keep turning round… It requires patience. And when you reach your goal, don’t expect solitude: the Japanese are keen photographers, and there is a real cult attached to their favourite volcano… There were at least a dozen Japanese around me when I took this photo.